Choice of equipment: The choice was between the Simrad TP10 and the Raymarine ST1000+; both were reviewed in Practical Boat Owner in April 2012 with the Simrad favoured, but little to choose between them. I chose the Raymarine unit since it allowed me to have a S100 wireless remote controller and also took NMEA input. It also has a display showing the course and the mode (e.g. active or on standby). However a Simrad TP22 with wired remote would have been slightly cheaper. Installation: Swallow Boats installed a horizontal knee in the after corner of the starboard cockpit combing to take the mount, however it was not thick enough and I had to strengthen using a further layer of ply and epoxy. I installed the pin in the tiller. It was not possible to meet the very precise dimensions insisted on by the manual but a Raymarine technician confirmed that what could be done was OK. It appears that the mm values in the manual are so exact because they have been converted from inches! I ran a dedicated 2 core cable from the electronics board to the socket installed in the starboard seat. In Use: For simply maintaining the set course the Tiller Pilot unit works well, in rougher conditions it can take up to 2 amps but mostly it takes less than 1 amp. I think that the display is vital; you really have to be sure that you are in automatic mode – or in standby mode in order to lift it off the tiller. You can’t always here the confirming “beep” when you press the button, especially if using the outboard. With regard to NMEA: it should be possible to get it to steer a course set on the Garmin Echomap, however, it will not steer using the wind direction from the NASA sensor since they use different NMEA sentences. So far I have not found the S100 Remote control useful*, I think it is a very bad design. It does not have an on/off switch but switches itself off after a time of inactivity. 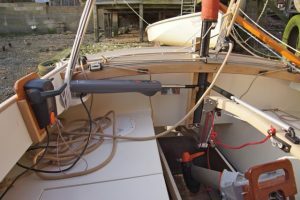 However it cannot then be reconnected unless the Tiller Pilot is in standby mode, and there is a relatively long pause while it reconnects with the Raymarine wireless base. In other words you have to plan ahead to use it and then keep using it else it switches off! As an example, I thought it would be good to sit up in the bow while motoring using the petrol outboard – it’s quieter up there. However when I eventually wanted to divert around a fishing float I found it had switched off! Fortunately Seatern missed it. *Note added 2017: Over time I’ve given up even putting the remote out ready for use. It was a waste of money and a Simrad with wired remote would probably have been better.